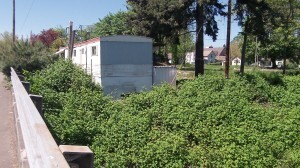 In the background is one of the two trailers remaining on the site. 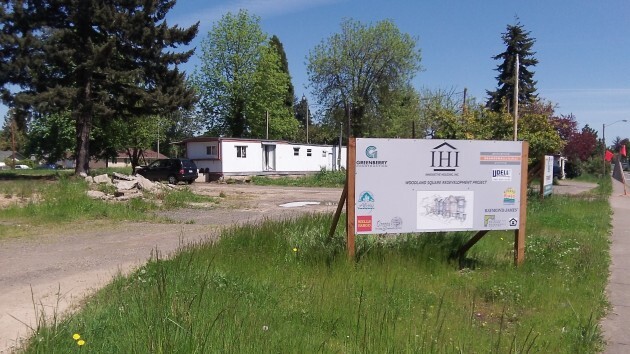 The transformation of Woodland Square, the dilapidated trailer park on Periwinkle Creek in Albany’s Willamette Neighborhood, is about to start in earnest. Seventeen trailers used to be there, and only two remain. The Portland-based developer of “workforce housing” will build a 54-unit apartment complex on the 2.1-acre site. The $10.8 million project is getting $1.45 million in aid from CARA, the Central Albany Revitalization Area. Part of the rest of the financing is based on state and federal tax credits that IHI is using to lower the interest rate on a mortgage. The company has said rents may start around $450 a month for a one-bedroom unit. The site is between Salem and Second Avenues and Pine Street and Periwinkle Creek. Why is concentrating “work-force” housing in an already dilapidated area going to really solve anything? In NY, Chicago, Detroit, these are called “projects” which turn into ghettos in short order. I’ll bet many, if not all the renters will be on public assistance already. They have no buy in so why do up keep.